One of the ways that I monetize this blog is through freelance writing. In fact, it currently brings in the most money of anything that I have going on around here. Since I know a number of you are interested in pursuing writing outside of your blog or journal, I want to take some time today to share some tips on making that dream a reality. I learned how to start freelance writing through trial and error and if you have any suggestions or additions, please leave them in the comments for everyone to benefit from! Before you start writing for other people, you write for yourself. This could be your blog or writing you have saved on your computer. Make sure that that writing is easily accessible for you to send off in case companies/sites request samples of your writing. For me, my entire blog served as my portfolio until I was able to write for other publications. Once that happened, I created a press and publications page where I could refer people. If you have a blog, concentrate on consistently publishing quality content. Not only will this draw more readers, but it will showcase the fact that you are capable of producing high quality work on a regular basis. Try writing about a specific topic or something outside of just showcasing your eats every day. Companies that you pitch need to see that you are able to write articles and longer posts of more substance. There are paid and unpaid freelancing opportunities. While I’m assuming everyone prefers to get paid, there are benefits to writing for free. Huffington Post does not pay its bloggers, but they have an incredible reach. I got the most page views EVER when my HP post went live. Writing for free allows you to build your portfolio and demonstrate the versatility of your writing when you begin pitching more paid opportunities. My advice is not to automatically discount unpaid gigs, but choose wisely which ones you will pursue. Do they have a large reach? Are they in a similar niche to what you want to write about? There are other sites such as Freelancer and Freelance that I have heard about from other people, but they require setting up an account and I can’t speak to their worth since I haven’t utilized them. My work I did for RunBuzz was organized through Upwork (formerly ODesk), but the actual open calls for writers were never enticing for me and seemed to pay very low. My best advice is not to waste time with huge job boards or looking on places like Craigslist for opportunities. These places have open calls for all kinds of subject matter and unless you are very proficient in technical writing about software or applications, it will probably be a waste of time. Instead, take time to figure out what sites you want to write for and concentrate on pitching to them. Make sure you are familiar with the types of articles/posts that are published on each specific site and tailor your headlines and content to be similar. Beyond Your Blog has compiled a huge number of sites that accept freelance work, both paid and unpaid. I only stumbled on it a month or two ago, but since then I had an article published on YourTango last month (a paid opportunity). As Chris Guillebeau emphasizes in his phenomenal book The $100 Startup (affiliate), you have to hustle. Most of the writing jobs I have gotten have been from me simply sending a pitch or asking someone directly. Think outside the box when it comes to freelancing opportunities if you are not having success pitching random sites. If, for instance, you want to write about health or fitness, find a local gym or studio and see if they have a blog. Ask if they are looking for contributors or if you can help them maintain or improve it in any way. For those types of places, the focus is on the workouts, customers, maintenance, etc and they may take you up on an offer to improve something that they may not have the resources to. If I have left anything out or forgotten to cover something that you have questions about, please email me at erinsinsidejob@gmail.com or leave a comment. May the force be with you! 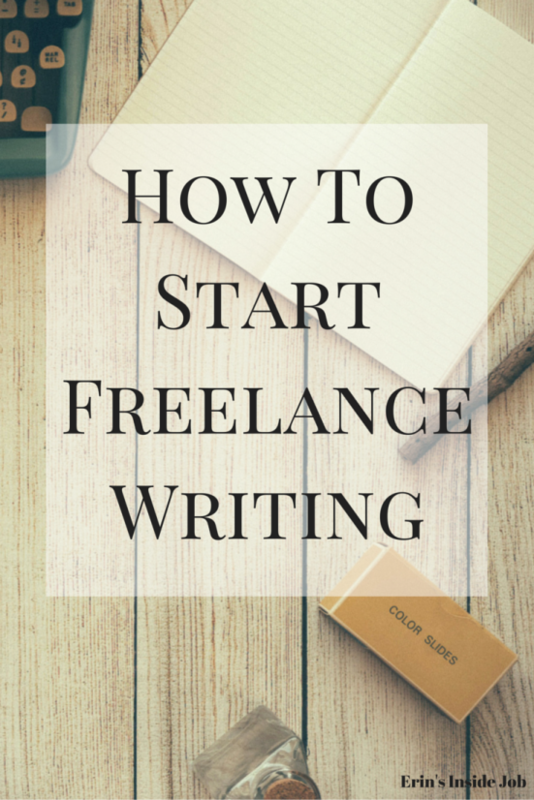 Everything you need to know about getting started with freelance #writing! Sometimes I wish I did more freelancing. I planned on it this winter/spring, but then realized that sometimes I just wanted my content on my blog, rather than elsewhere. I need to find a balance of it. Herm. These are great tips! Thanks for those resources! I’ve done a few paid freelance articles for magazines and free stuff for sites like Elephant Journal, and hope to do more — I just need to put more time and effort into pitching. It’s hard to concentrate on growing a blog following and my writing portfolio at the same time, as some ideas end up as blog fodder instead of articles. Totally interesting and helpful. Thank you, Erin! This is so helpful! I recently decided I wanted to try my hand at freelancing. I just didn’t know where to start. Yay I hope it helps! Oh sweet I will have to check those out as well! I have been working to build my writing portfolio, but it’s the hustling for jobs that I’m not so good at. Getting paid sometimes would be nice. I enjoyed this post. Thanks for the tips. Anytime! Let me know if I can help out at all! I’m a relatively new freelancer and I also find hustling for jobs a bit challenging. Thank you for the Beyond Your Blog tip. Of course! Let me know if I can help out in any other ways! Good post, Erin! I spent many years working as a full-time freelancer, but I was working for a media company that offered steady work. I think if I had to pitch all my articles to various platforms, I would have to consider that a second job. It’s tough! But truthfully, I have found some legitimate long-term clients from Craigslist. There’s a site called: Search Craigslist where you can scan all of CL with a single search term, such as Freelance Writer. This gives you more opportunity, and writing remotely usually isn’t a problem so it’s a good idea to broaden your search to all areas. Of course we know that lots of scammers are lurking online, but they’re easy to spot — look for the typos and vague company profiles. Great post and exactly what I needed to read right now as I’m trying to generate income from writing. Thanks for sharing! Thanks Renee! I hope it helps!